Thanks for the reference it’s definitely helpful. Lance, I have a feeling that you are using baskets for your “Hot Zone”? If you do a simple split bottom fire you can easily get six to eight and still maintain a safe zone to transfer to when needed. That will buy you some extra space. Im using the slow-n-sear without the water pan as one large basket. I'm no expert but I certainly agree with a two-zone config while doing burgers, yet I don't necessarily dedicate 1/2 my surface to the safe zone; I might give 1/4 or 1/3 area for this and simply stack burgers as needed. I don't understand the notion of not being able to get 8 burgers on a 22". Well technically speaking the way I’m cooking I’d have to fit 16) 1/2lb burgers on a 22” grate..... Now a bigger hot zone and stacking the burgers in the safe zone is a great idea! 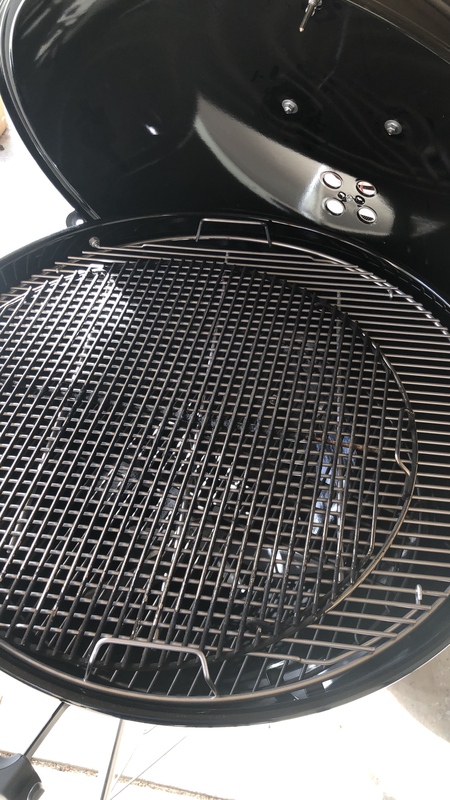 If you have the space buy another Weber 22" Grill which would be a cheaper option. It’s easy to over engineer the whole project. As long as you have a cool spot I just don’t see the issue. Reverse the lay out, more hot quick which will give you a reasonable place to stack cooked burgers. We are talking about burgers here not twenty filets! Think ahead, plan it and keep it fun! You don’t NEED a bigger grill, just learn to use it to best advantage. Now, if you WANT a bigger grill, that’s something else entirely! I have cooked for twenty on a basic kettle so, I know it can be done. I think Fletch and I are talking about the same concept. Last edited by Timothy F. Lewis; 04-12-2019 at 05:29 PM. I will say the idea of having a second grill to keep the burgers warm is what I do. I use my jumbo joe with a small amount of coals just to keep the stacked burgers warm. I cook them on the performer and just add the burgers to the JJ when done. When they all are cooked I spread the coals from the performer out and toast the buns. No need for an expensive 26.